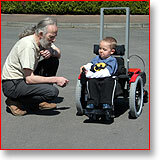 Dan Everard's principal expertise is as an electronics designer, and he has over 30 years experience of designing computer controls for wheelchairs. The latest has been developed from the highly successful Turbo and Dragon Mark I controllers, together with all the customer feedback he has received on these. It is highly versatile while still simple enough for a 12 month old child to operate. Most wheelchairs have velocity controllers, which control the speed of each motor, but the dragonmobility controller can either be set as a velocity controller or a torque (power) controller. With a torque controller the user determines the amount of power delivered to each motor to move on a particular surface, and the speed is then controlled by additional joystick movements. The result is a very responsive system and the driver is able to compensate for changes in drive surface, texture, slope etc. The adjustable steering geometry of dragonmobility chairs allows a balance to be achieved between safety and agility according to the needs of the user. This means that the user is very much in touch with the environment, and with careful positioning of the centre of perception at the centre of movement of the chair, and the placing of the user at the front of the 'combined body image', moving in a dragonmobility chair is more like the able-bodied experience. The human brain can sense power and acceleration but not speed. Driving at a particular speed (as with a velocity controller) has to be learned and is less responsive. The difference between torque and velocity controllers is a little bit like the difference between using a manual and an automatic gearbox in a car. The dragonmobility torque controller can be used immediately and intuitively by those unused to wheelchairs. 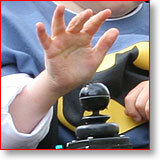 In fact, with very young children, it complements the natural developmental instinct to move independently. Although it might take someone who is used to a velocity controller a little while to adjust, most people who have tried both appreciate the extra freedom a torque controller gives. But it's your choice! A user has described it this way: "You drive a wheelchair, but a Dragon moves."